The 35 minutes duration of an average cycle process is fully automated and totally monitored. 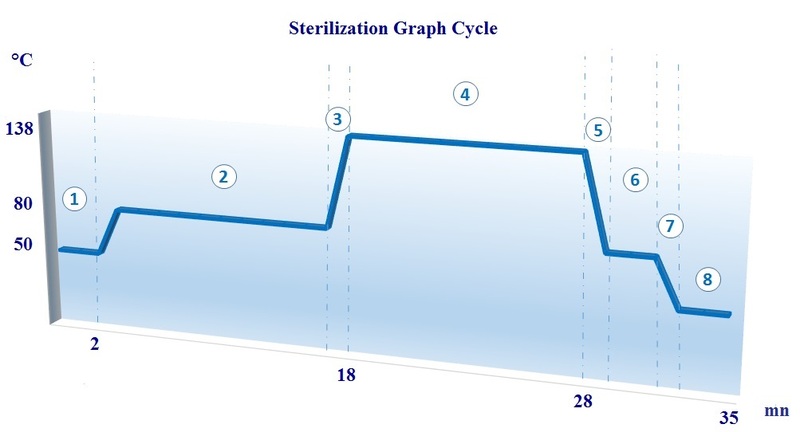 A computerized control system scans the process and automatically prints a batch report at the end of each cycle with the essential sterilizing parameters for accurate record keeping. Algeria, Bahrain, Egypt, Estonia, France, Greece, Guadeloupe, Hungary, India, Jordan, Kuwait, Lebanon, Mayotte, Morocco, Nigeria, Peru, Reunion Island, Saint Lucia, Sultanate of Oman, Syria, Turkey, Uruguay. The ECODAS T1000 complies with standard NF X30-503-1 (click to view document).